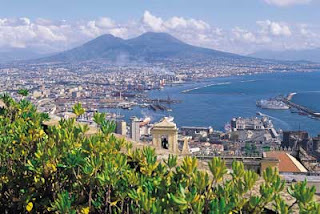 Work continues on the super volcano at Naples amid the usual controversy. The only real super volcano is the one in Sumatra that evacuated a large lake. The others have the footprint without an equivalent evacuation that I have noted anyway. They are all chronically active of course, but at a low level. Thus we get a nasty event every few years but possibly avoid an event that is a global catastrophe. The major events look great in the geological record but also appear to be quite survivable. The truth is that we still lack realistic bounds in time and space when it comes to understanding volcanoes. We should have learned after Mt St Helen’s to recall our real ignorance when mother nature comes out to play. In the meantime, the real threat continues to be Mt Vesuvius. An exclusion zone should be established and present land owners encouraged to retreat from it. It is an obvious and known danger best simply avoided. (Reuters) - Across the bay of Naples from Pompeii, where thousands were incinerated by Mount Vesuvius in 79 AD, lies a hidden "super volcano" that could kill millions in a catastrophe many times worse, scientists say. The boiling mud and sulphurous steam holes of the area west of Naples known as the Campi Flegrei or Phlegraean Fields, from the Greek word for burning, are a major tourist attraction. But the zone of intense seismic activity, which the ancients thought was the entrance to hell, also could pose a danger of global proportions with millions of people literally living on top of a potential future volcanic eruption. "These areas can give rise to the only eruptions that can have global catastrophic effects comparable to major meteorite impacts," said Giuseppe De Natale, head of a project to drill deep under the earth to monitor the molten "caldera". One such meteorite impact is thought to have caused the extinction of the dinosaurs 65 million years ago when debris thrown into the atmosphere from the huge explosion plunged the earth into darkness. Scientists plan to drill 3.5 km (2.2 miles) below the surface to monitor the huge chamber of molten rock near Pompeii and give early warning of any eruption from a 13-km-wide collapsed volcanic caldera. The Campi Flegrei are similar to the Yellowstone caldera in the U.S. state of Wyoming but of more concern because they are in an area populated by around 3 million people in the Naples hinterland. "Fortunately, it is extremely rare for these areas to erupt at their full capacity, as it is extremely rare for large meteorites to hit the earth," De Natale told Reuters. "But some of these areas, in particular the Campi Flegrei, are densely populated and therefore even small eruptions, which are the most probable, fortunately, can pose risks for the population," said De Natale, from the Vesuvius observatory at Italy's National Institute for Geophysics and Volcanology. "That is why the Campi Flegrei absolutely must be studied and monitored. I wouldn't say like others, but much more than the others exactly because of the danger given that millions of people live in the volcano." However, the project, funded by the multi-national International Continental Scientific Drilling Programme, has run into major opposition from some local scientists who say the drilling itself could cause a dangerous eruption or earthquake. Benedetto De Vivo, a geochemist at Naples University, has said the drilling could cause an explosion. The Naples city council blocked the project in 2010 but it resumed on the site of an abandoned steel mill at Bagnoli, west of Naples, late last month after the recently elected new mayor, Luigi De Magistris, gave the go-ahead. De Natale scoffed at the objections, saying that the drilling was perfectly safe and that similar probes had been sent down by mining projects looking for sources of thermal energy in the 1980s and earlier. "There were dozens of drillings in the past, with much less secure instruments for industrial motives and nobody said anything," he said. He added that those raising objections were not experts on drilling and that their suggestions of potential earthquakes or escapes of magma or liquid molten rock, had been exaggerated by the local press. "Some of the things they suggested are laughable," he said, adding that the project's priority will be scientific knowledge and safety of the local population rather than industrial exploitation as in the past. "We believe the security of millions of people deserves the most powerful methods of inquiry without thinking too much about the economic aspect," he said. He added that drilling is the only way to discover the geological history of the area because successive eruptions buried previous evidence. The probe has already found volcanic rock from a major eruption 15,000 years ago. De Natale's team has begun drilling a pilot hole at the Bagnoli site, where a long jetty built to load steel is used by joggers and courting couples enjoying the spectacular Neapolitan sunsets. The pilot hole is aimed not only at studying the stratification of the area but to establish a deep geological observatory with new instruments which De Natale says are many times more sensitive than those in the past. "This will increase by a thousand or 10,000 times our ability to detect small episodes that are precursors of future eruptions," he said. The project also aims to study the cause of a phenomenon known as bradyseism which is a gradual raising and lowering of the earth's surface because of deep volcanic activity. This is episodic but in the latest phase the ground has risen by 3.5 m (yards) in 15 years, the most since medieval times. This movement forced the evacuation of 30,000 people temporarily from Pozzuoli in the 1980s and a fishing harbor in the old part of the town was completely abandoned. Once work is complete on the pilot hole, scientists plan to drill much deeper, to around 3.5 km where temperatures are at around 500 degrees C (930 F). But De Natale said this could take another 18 months and the area for the second phase has not yet been decided. His team has developed new fiber optic sensors able to withstand the extreme heat that would have destroyed earlier electronic equipment. "We will be able to identify the smallest signs of a future eruption...this is an enormous mitigation of the volcanic risk," he said. De Natale says there will be no risk of an escape of magma because the molten chamber is at 7-km depth or lower and sensors will give ample warning of temperatures that reach 1,000 degrees C at the molten core. "We will stop everything if we detect temperatures at 500 degrees...we can close the top of the drilling hole hermetically in a fraction of a second," he said. Local people are divided on whether the drilling could be dangerous. "There is a risk that the drilling can lead to a shift of the earth's surface and if that happened, rather than helping to predict future problems, they will be creating them," Pozzuoli student Marco Laporta said. Many are more sanguine. "Back in the 1980s they said we would all be blown up and we weren't," pensioner Luigi Bruni said.